We returned to a lunch that we had a lot when Philip was trying to lose weight. Alton Brown claims it was instrumental in him losing weight (intentionally). Our iteration featured Trader Joe’s Lightly Smoked Sardines, on an English Muffin with hass avocado. The slight smokiness makes the sardines a little more interesting. The avocado was 48c or 24c a serve. Lunch today cost $1.59 per serve. It was our night for our monthly get together with a friend, so we ate at Gordon Birsch again. Because we weren’t on camera, we ordered a burger again. The Gastro Pub burger is a great burger so we had it again this time. The burger is $12.25 but with tax and tip about $15.80. Pacing ourselves as we were heading out for a ‘big game’ party we had half a muffin with a fried egg on top ahead of the party. Lunch today cost 75c per serve, but it was more of a snack than lunch. It was a party. Lots of delicious party foods, catered by our excellent hosts. We contributed wine, so let’s say $4 a head today. Feb 4: Lunch out; Quick Snack! We were recording another Lunch with Philip and Greg so we ate out for the second day running. Today we recorded in Gordon Biesch and we both had the Beer Battered Fish and Chips. That’s their picture featured above. 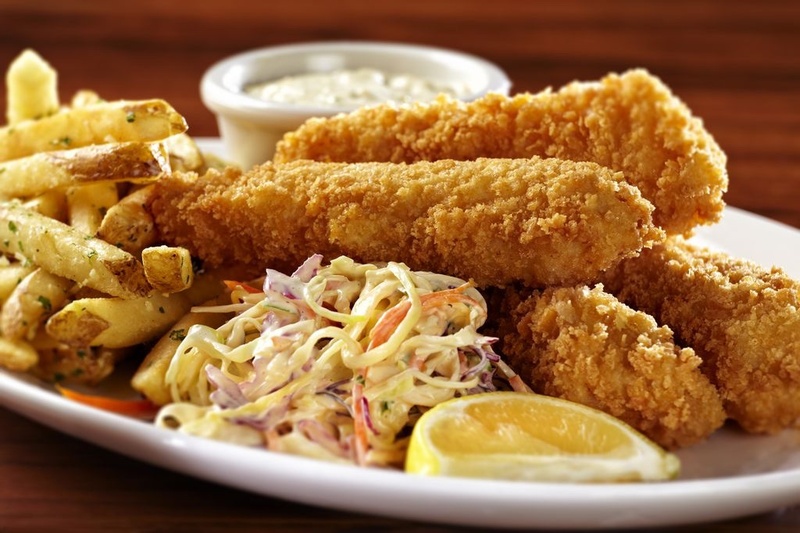 The batter was appropriately crispy, the fries (regular) are always good, and our coleslaw was served in another small bowl, preventing fries or batter from becoming soggy. On the menu for $16.75 the reality is much closer to $22 with tax and tip. It’s a huge serve and, although we didn’t finish everything on the plate, we both felt over filled afterward. One reason we chose the dish was because it’s not something we’d ever cook at home. Maintaining oil for frying, and safe conditions to fry in, is more effort than most fried food is worth. So, it’s an eat out/take out treat for us. That stuffed-full-of-food feeling didn’t go away, despite burning up some energy at our new home. So we postponed the planned dinner until tomorrow night. We ultimately had a ‘Quesadilla’ of flatbread, refried beans, salsa and cheddar. We last did this for lunch on Jan 20th where it cost $1.49 per serve. Author PhilipPosted on February 5, 2016 February 5, 2016 Categories UncategorizedLeave a comment on Feb 4: Lunch out; Quick Snack! We did this quesadilla for dinner on January 11th. Today’s version has no eggs, and we just used cheddar, so it’s a bit cheaper. 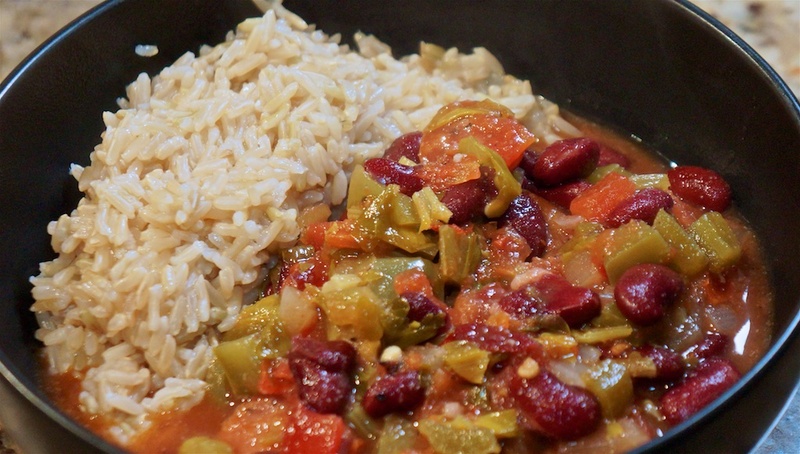 Tonight we’re having the third and fourth serves of last night’s Southwest sausage, beans and rice. Tonight’s dinner (again) cost $3.08 a serve. Being a repeat there is very little effort involved. Another indulgent Friday: wild caught smoked salmon on an English muffin with a poached egg on top. Add a squeeze of lemon juice to fake a ‘hollandaise’ taste with the egg and it was delicious. 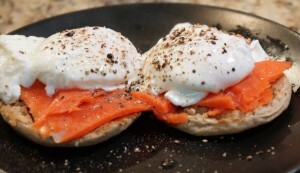 Wild caught smoked salmon with organic eggs on an english muffin. Lunch cost $4.50 a serve for smoked salmon. 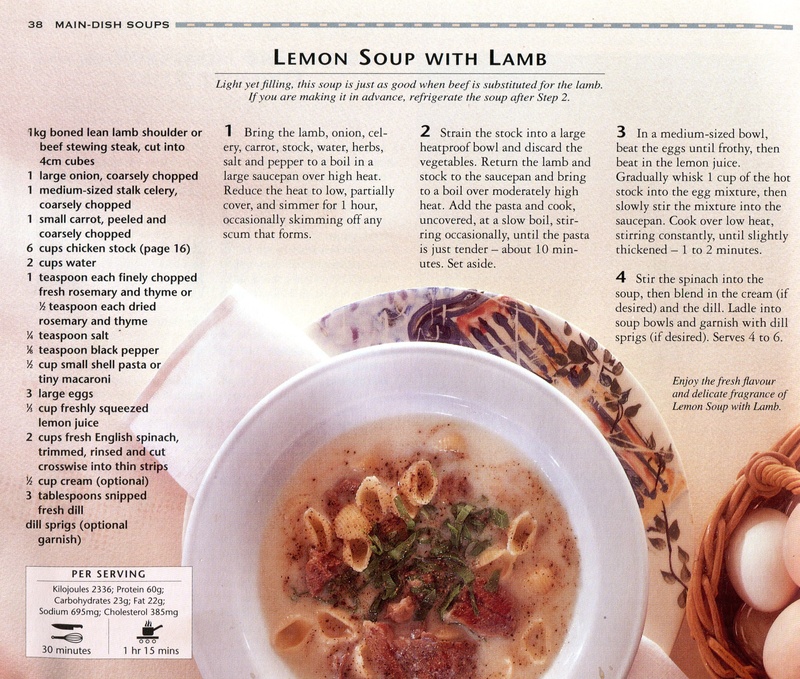 We went back to a recipe we haven’t had for about two years: Lemon soup with Lamb. 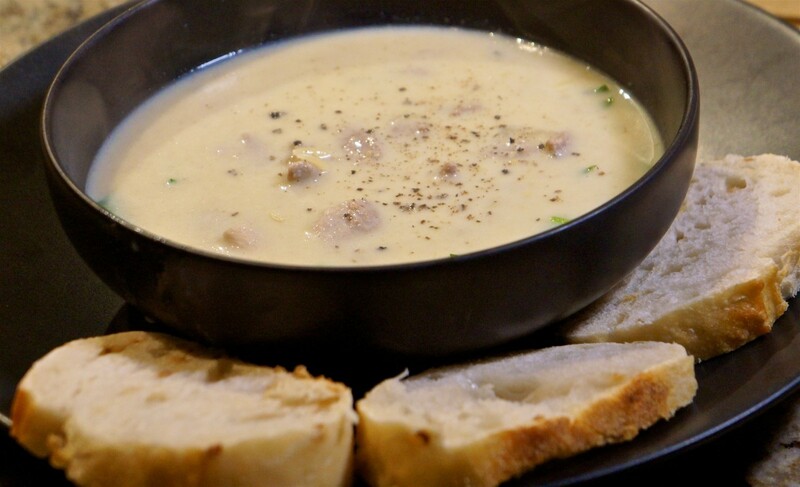 Initially we tried this soup because of the unusual way it is thickened: with eggs. Greg used meyer lemons – give to us by a friend – instead of regular lemons and they are perfect for this recipe. The slight sweetness and reduced tartness of the meyer lemon really works in the recipe. We also used spinach off the balcony garden which was sliced and placed in the bottom of the bowl. We also used orzo instead of larger pasta and dropped the cream. It’s not needed. Add 10c a serve for herbs. Tonight’s dinner cost $5.75 a serve. One of the great things about cooking your own food is leftovers! 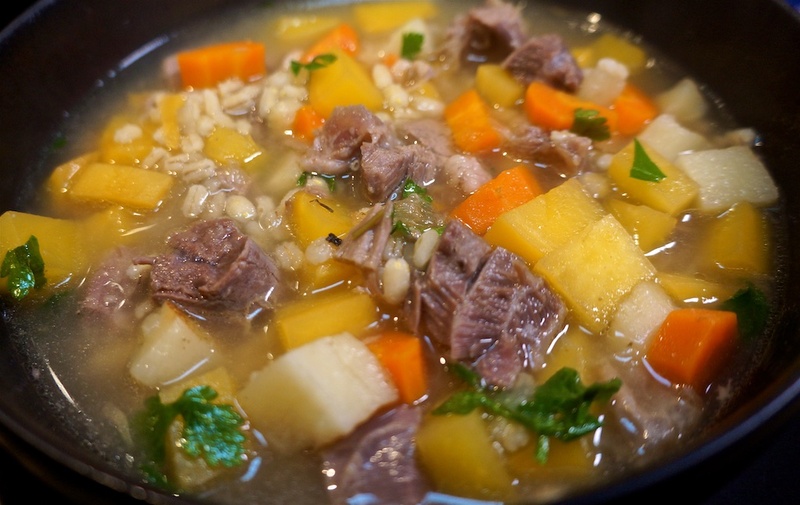 There were two serves left of Friday’s Ham hock and lentil soup, and that’s what we had for lunch. $2.50 per serve. We had an afternoon snack of half a meatloaf sandwich each. Only half a serve, split two ways, so $0.85 for the meatloaf, and two slices of multigrain bread, say 40c, split two ways so $1.05 for the half sandwich. 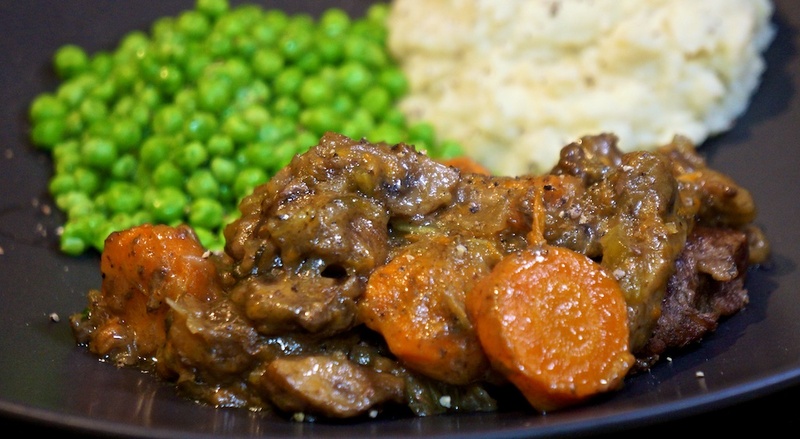 We’re in what passes for Winter in California, so a pot roast is a wonderful dish for the season. The slow cook also fills the room with wonderful smells across a lazy Sunday afternoon. The recipe Greg chose is Pot Roast with Mushrooms from Serious Eats. We went a little overboard on the beef. We’ve been getting a monthly delivery direct from farm, and haven’t been keeping up. 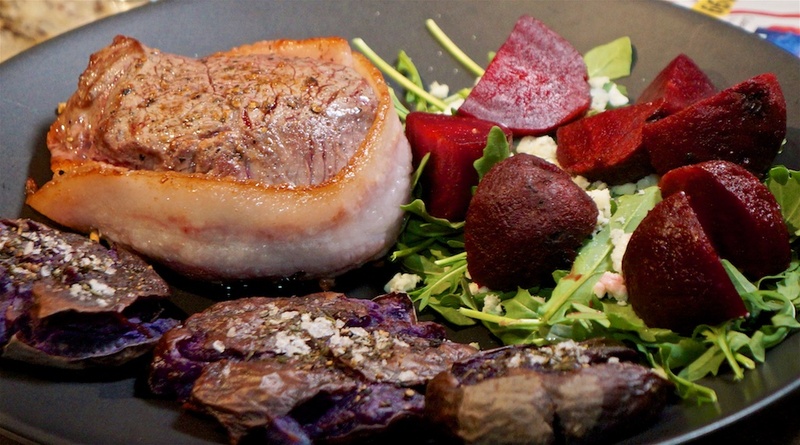 The quality of the meat is very high – grass fed and organic – but so is the price. We used a 12 oz (350 g) chuck steak, which will give us a 6 oz serve each. Six ounces is the size of a typical protein serve in a restaurant. Our steak cost us $7, but conventionally grown would run around $3.75-4.00 for 12 oz. Two 8 oz (250 g) boxes of mushroom were $6. The vegetable components ran to around $1. A quart of beef stock is around $3 (depending on the quality) and half that was used in the recipe, so $1.50. I’ll allow 50c to cover the flour, salt and pepper. Our organic meat extravaganza cost us $16.00 or $4.00 per serve. With more conventionally grown beef, the meal would have cost $12, or $3 a serve. We served with left over cauliflower mash and frozen peas. The mash was 40c serve, and the peas around 50c serve. The pot roast was amazing for such simple ingredients. You can read about our background in our About page. Our goal is to encourage you to cook more of your own food. Each day we’ll be posting details about what we eat. There will also be video episodes where we cook the food we eat in a restaurant, particularly when we travel. Greg and I eat most of our meals at home, prepared (mostly) from fresh ingredients. We’ll share the recipes and techniques we use to eat “healthyish“. Since what is ‘healthy’ seems to be as variable as the weather, we’ll share what we’ve found during Philip’s journey back to robust good health over the last five years, and why we don’t necessarily believe a lot of conventional food wisdom. Our focus is on easy to prepare meals that will be cheaper than eating out. So welcome. Each day we’ll be blogging our meals from the day before, with recipe and approximate cost of ingredients. We hope you’ll realize how easy it is to eat better, for less. 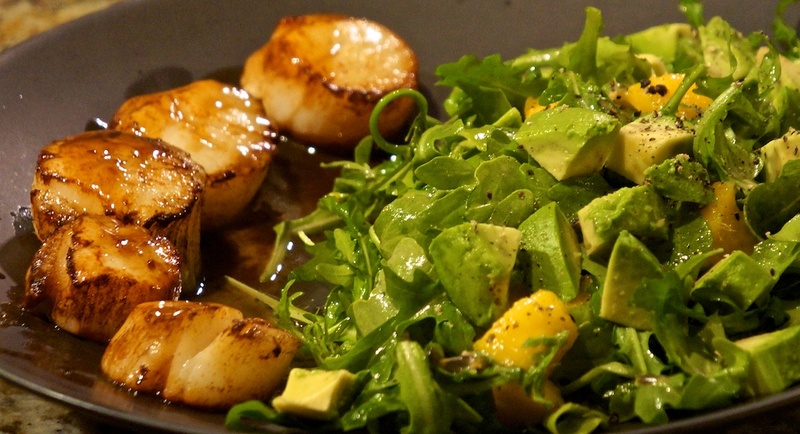 The image above is of pan seared scallop with butter ponzu sauce, served with arugula mango and avocado salad with passionfruit vinaigrette. Easier to make than say! Author PhilipPosted on January 1, 2016 January 1, 2016 Categories UncategorizedLeave a comment on Hello, and welcome.